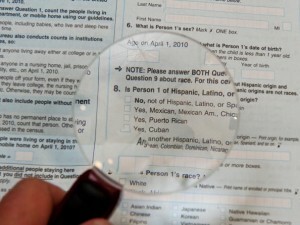 The U.S. Census form first asks respondents whether they are Hispanic or Latino and then asks about race. Asking someone “Where are you from?” may seem simple enough, but it’s actually a tricky question, particularly for mixed-race Latinos. For instance, before asking your race, the U.S. Census form asks whether you are Hispanic or non-Hispanic. What if you identify as both? My father is a genealogy buff, and although I’ve generally been uninterested by it, I do owe it to him that I know at least a bit about where I come from. My ancestry is quarter German, quarter Irish and half Chicano. My father grew up in South Texas, an area heavily populated by Latinos. For many Americans, that would seem to indicate that most residents are immigrants who recently settled in the area. But going back far enough, it’s likely that my ancestors have been around since Texas was first colonized by Spain. In other words, the border crossed us, not the other way around. Underlying Ken’s comment is a set of complex issues Latinos face in the United States. Aside from not “looking Latino,” the mere fact that some of us have a foot in both mainstream culture and another in Latino culture can create conflict. Added to that, Latinos are, for better or worse, caught in the middle of the debate over immigration reform. And that means many Latinos are considered immigrants by default. I’ve often made a point to have the whole “Where are you from?” conversation in Spanish if I can help it. Having the conversation in English can be frustrating. As a Latino, telling someone you’re American is sometimes insufficient, even if it is convenient shorthand (though I’ll admit to doing it). There’s some irony that in English, there’s no equivalent to the convenient Spanish shorthand for being from the United States, “estadounidense.” The term “American,” I’m often reminded by my Argentinian stepmother, refers to an entire hemisphere, not just the U.S. Oddly, it’s sometimes immigrant Latinos who have the hardest time understanding why one would identify as American rather than Mexican-American or Colombian-American. Saying I’m estadounidense identifies me in an exact way. I’m a result of the unique blend of cultures that could only have resulted because of a United States story. I’m not trying to sound glib, or defensive or even particularly idealistic. I identify as such because I have more in common with someone in Miami or Los Angeles than I do with most Mexicans. Given the rage and xenophobia engendered by the immigration debate, I’m a little surprised there hasn’t been a movement in certain circles to create a new term like “United States- ian.” If the right term could be found, I’d happily abide by it. After all, where am I from? Next door. A.C. Valdez is a freelance producer currently working with WAMU 88.5. You can follow him on Twitter here. The right term has been found, centuries ago. “American” to define residents of the USA was a phrase coined not by Americans, but by the colonial brits, to emphasize that britians born in the USA were not actually british, but were american.